Navigon has today announced three new PNDs to join the US product line up, the 3300, 4300T and 7300T. 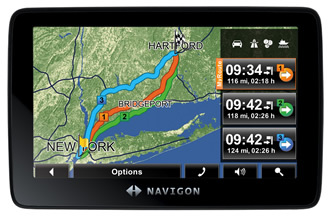 The 7300T is the showcase device and features NAVIGON MyRoutes, the first device to do so. MyRoutes gives you a choice of up to three routes to your destination with all the options displayed on the map with ETA and driving times to allow you to make a choice. The 7300T also features 3D mapping with buildings and terrain complete with digital elevations, hills etc and real time spoken traffic updates. The 7300T will be available Q2 2009 and will sell for $399.99. 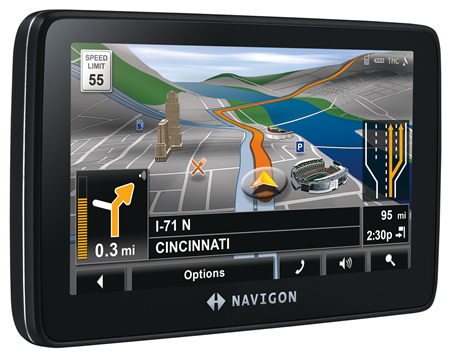 The 3300 max features a 4.3" widescreen, MyRoutes, Reality View, Lane Assistant Pro and multi-destination trip planner. The 4300T max adds Traffic with real time spoken alerts, Rand McNally content and Buetooth hands free. The 7300T proves then that Navigon can get Panaroma 3D and 3D buildings working together on 1 device. A year after the previous models were launched 8110 users are still waiting for any additional features to be added to the 'flagship' model. Nothing annouced for the EU yet, but I suspect we will also get 'new' models and yet again no updates added for a device which is still less than a year old. It's CeBIT this week so any EU announcement will doubtless occur this week. New EU models are now on the web. However Navigon have dealt 8110 users a great blow. "To mark the LIEFERSTART of the NAVIGON 7310 in May you will be able to download our software update and extend the functionality of your NAVIGON 7210 with all the new features of the NAVIGON 7310!" No idea what LIEFERSTART" is but why are Navigon offering all of these new features to users of the 7210 and completely neglecting all people who brought the 8110. It would be nice if you can get Navigon to answer this question, but I very much expect a non answer from them. I don't expect the features for free, but to be even offered them would be nice. We are sorry to inform you that we can not give you any information yet about the new features whether they will run on the older divices or not. Please be patient and visit our homepage: www.navigon.com in the near future to be up to date. Eventually got a reply from Navigon support which suggests the 8110 WILL get a software update. However I would be more pleased if this was confirmed on the website. With 2 days left for my 30 day return policy, I have just put my 8100T in the mail for a refund. Looks like the 7300T will have every feature, AND several more, won't have to pay for an update, NAVIGON will transfer my FreshMap, and the 7300T will be cheaper! I'm not tempted to buy a NAVIGON since they are screwing the 8100/8110 owners with no updates. If there is an update, they may charge (as tech support told me). I'd just assume get a couple hundred dollars back and have a better unit. Reading the details on MyRoute, sounds very good (in writing). I got the 8100 for terrain view, not the big screen, so going to 7300T is not a complaint. I certainly don't mind paying for an update. My objection is how a lower model is getting all the 'bells and whistles' of the 7310. If Navigon are confirming a upgrade for the 8110 the website should clarify that updates will be for 7210 and 8110. Saying it's for one is misleading. When I called tech support, he said that there would be an update to add My Routes sometime in the future and he didn't know if there would be a cost, but made it sound like there would be. I asked about the other features the 7300T has that the 8100T doesn't like 3D buildings and such and he said he did not know if they were going to develope those or not. He only knew about the My Routes. My Routes is something, as I do like the way it shows 3 different routes to pick from. Hope they implement the voice control as the 8110 already has the current voice entry that works quite well. I expected the 3D buildings wouldn't get added as that feature has been available on the 7210 for sometime yet and Navigon have made no moves to add it to the 8110 already. I think the biggest issue is 8110 users have seen numurous software releases for the 7210 and additional downloads where as the 8110 has recieved hardly anything since it was released. The new features like City View 3D, My Routes and so on will be available for the 8110 unfortunately we can not yet say an exact date. But it will be shown on our website as soon as everything is sorted. Wow that is reallty good news. Maybe Navigon realised the mistake when they announced the 7210 would get the features but made no mention about the 8110. As it's different hardware platform I understand the delay, but it's nice to know it's being developed. Rumour has it on the German forums, is that a 8210 maybe in development or something?